Retsina has been given a bad rap, starting about 500 b.c. when some picky Athenians turned up their Grecian noses at the scent and taste of pine resin. Being a readily available natural resource — pine forests were a lot more common in Greece than cork groves — it was used to seal traveling amphorae of white wine. These plugs of pine added a certain flavor to the wine — turpentine comes to mind here. Heroditus records no complaints back then. For a while it was even trendy to add a little pine mash to the freshly pressed grapes. But when the Turks began overrunning parts of Greece a few hundred years later, a legend grew that pine sap was added to the wine stores to spoil them for the invaders. That sealed retsina’s fate in the area of public relations — ’til now. Publishing a book requires a thorough review. I discovered that my novel mentions retsina 34 times, not in a loving way. According to my protagonist Sarah, retsina can start your motorbike, remove nail polish, cure you of thought, and cause –what is it?– oh yes, memory loss. Unfair Sarah! I decided to correct this slander. For my first book party, held in a fancy Greek restaurant in New York City, I decided to create a cocktail based on retsina. A friend and I experimented with lots of ingredients (this is pure fun, by the way, as long as you’re not planning to drive anywhere.) We couldn’t get it quite right. Then the bartender at the restaurant added a little Samos, a sweet Greek dessert wine to our concoction. Bingo! The “Café Tempestini” was born. We served it that first night, to a lot of discerning i.e. highly skeptical — but brave– Greeks and they were amazed. The main ingredient is rather disguised of course, but you can still taste retsina in there. Now I mix a batch at every bookstore event, book party, dinner party. People adore it; and how it opens their ears and imaginations and wallets! Books are flying out the door. 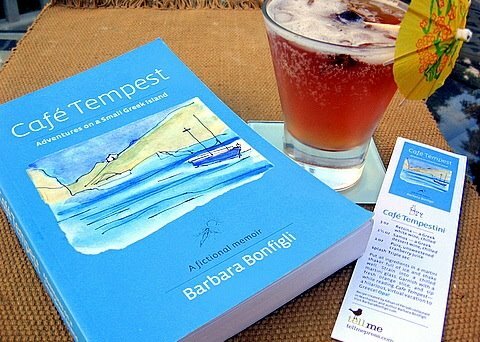 To learn about Barbara Bonfigli and Café Tempest, feel free to visit any of these sites. Thanks, Nikki, for sending the “Tempestini” out into the world. It’s faring pretty well in company with a reading from “Café Tempest”. Now I’d love to hear from your intrepid readers after they’ve mixed up a batch and found anywhere beachlike — it could be the tub if a beach isn’t handy — to try it. It’s a very zippy, delicious, ORIGINAL party drink for a warm day, so be fearless in serving it to your August guests and drop-ins. Retsina, by the way, is the perfect accompaniment to any of the terrific Greek recipes, by Chef Ana Espinosa, included in my book. for more tales of retsina and info on its creator and her novel, go to http://www.cafetempest.com.